How to buy rice paper wrappers. Plus, suggestions for using them, in addition to summer rolls. What are Rice Paper Wrappers? If you’ve ever had a summer roll (or salad roll) from a Vietnamese restaurant, you’ve eaten a rice paper wrapper. They are super thin wrappers traditionally made from rice, water and salt that can be filled with almost anything. Since they are so thin, the wrappers are almost translucent so you can see whatever is inside. They also have a nice chewiness to them. We’ve most often seen rice paper wrappers wrapped around shrimp, pork, fresh vegetables and noodles. 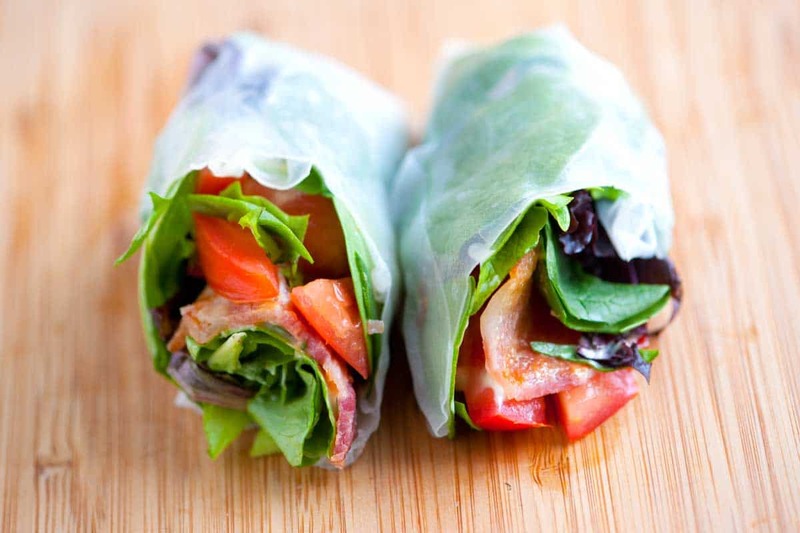 That doesn’t mean you couldn’t wrap them around other ingredients — we have even filled rice paper with bacon, lettuce and tomato for BLT Summer Rolls. YOU MAY ALSO LIKE: How to make summer rolls filled with bacon, tomato, lettuce and a lime-flavored mayonnaise. Jump to the Bacon, Lettuce and Tomato Summer Rolls Recipe. Depending on where you live, you might get lucky and find rice paper wrappers sold in the International food aisle of your local grocery or health food store. Otherwise, the best selection will be at Vietnamese or Chinese food market. Online is also an excellent option. Avoid wrappers that are made with 100% tapioca since they are trickier to wrap. Instead, look for wrappers made with rice or with a combination of rice and tapioca. (By the way, rice paper wrappers should be gluten-free. Some packages say wheat is an ingredient. It is likely an error in translation). I really like the 8 1/2 inch wrappers since they are easier to work with that wrappers that are smaller/larger. Look for the Three Ladies brand or one with a red rose on the label. We’ve had great success with these and they are widely accepted as quality options. If there are multiple options, choose the most expensive option. Rice paper won’t cost a lot anyway, so reaching for the option that’s 50 cents more isn’t too much of a stretch. Once the package has been opened, place it into a resealable plastic bag and store in the pantry or cupboard. Rice paper is sold in dried sheets. Before using them, you will need to rehydrate them to make them pliable. 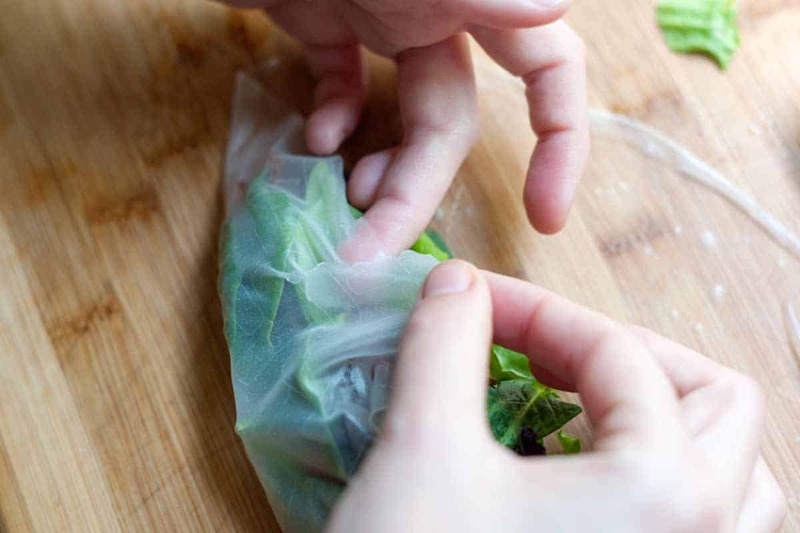 Once rehydrated, rice paper can be eaten as is — like with summer rolls — or fried. Fresh rolls are the most common way we work with rice paper in our kitchen. It isn’t something we recommend you bake with, though. When it comes to frying, rice paper becomes incredibly crisp and light. For more tips on frying rice paper rolls, we recommend reading through Andrea Nguyen’s article. Wrapping rice paper is easy — just as easy as wrapping a burrito. You will also get better the more often you do it. Even so, they don’t need to be perfect! I mentioned before that rice paper is sold in dried sheets. To make them more pliable and ready for rolling, you will need warm water. 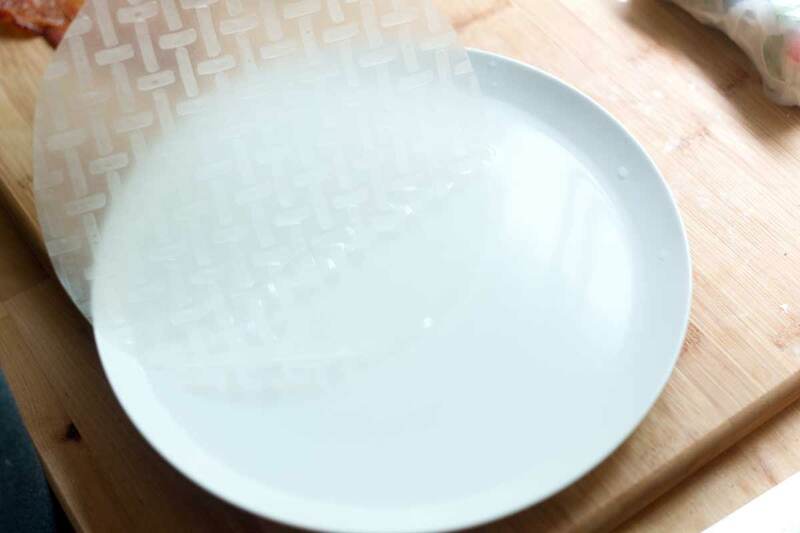 Add warm water to a shallow dish or baking tin that is wider than the rice paper you are using. Working one rice paper sheet at a time, slide the sheet into the warm water. Leave the sheet in the water for a few seconds — anymore and it will become too soft and start sticking to itself. You are really just dipping it into the water. Remove the moistened, but still slightly firm rice paper sheet and place it onto a flat work surface. Leave it for a minute or two — in this time the paper will become even more pliable. It is ready to fill and roll when it’s pliable and a little sticky. Now, all you need to do is wrap. Remember, it’s just like wrapping a burrito. Place the filling in the middle of the bottom third of the wrapper. 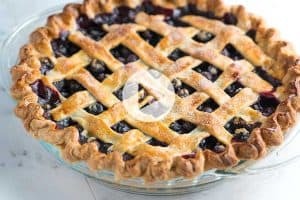 Bring the lower edge up and over the filling. Fold in the two sides. Firmly, roll the whole thing up, using your fingers to keep the fillings pushed towards the middle of the roll and tight. When working with or rolling the wrappers, you might find one tears. If the rice paper tears a bit, don’t worry, just overlap the two torn edges and continue on like nothing happened. Fresh summer rolls are best eaten straight away, but you can store them wrapped in plastic wrap in the fridge for a few hours. Just keep the rolls away from one another as they tend to stick to each other over time. If you are storing overnight, you might want to add a layer of damp paper towels before the plastic wrap to keep them from drying out. I noticed the rice paper we have at our local paper has a bad after taste. Any way to eliminate that after taste? Hi Chris, I’m not really sure how to eliminate this. I’d try a different store and see if you can find another brand sold in your area. Do you dip them in a sauce? 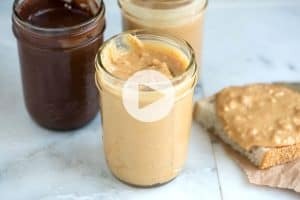 Hi Ramona, For traditional spring rolls, we love a peanut sauce, although we do not have a recipe for one on Inspired Taste. A Vietnamese friend taught me to lay a damp kitchen cloth down to work on and use one to cover the rolls while you work if you are making a large number it does help. Her recipe used one red lettuce leaf, rice noodles, Thai basil, cilantro, mint leaves, shreads of carrots, cucumber sticks and chicken or shrimp. Can you deep fry a spring roll after softening the rice paper, filling and rolling it? Yes, you can deep fry the rice paper rolls. 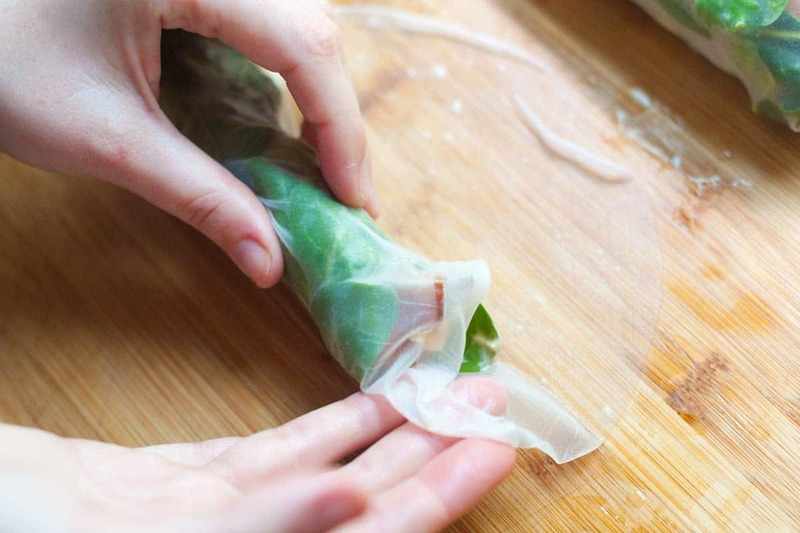 Since rice paper is so fragile, quite a few people prefer to use wrappers that are labeled as spring roll wrappers (which often have a bit of wheat flour added). These hold up a little easier. Just embarking on trying my next burger on a rice wrap. I’m tired of losing all the good juice from a delicious burger (pickles, GF sauce, lettuce, onion). The BLT will be first on my ‘to-do’ list. Thanks for your good work on this subject! Yes, I also thought this was a great way to enjoy a BLT especially during this hot weather. I plan on taking them to a cookout. 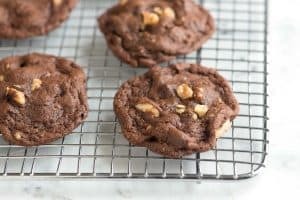 Can these be made the night before and stored in the refrigerator? Thank you for your wonderful help. I have never used rice paper wrappers before. Hi Maureen, Rice paper tends to dry out when left overnight. If you can, make them the day of and then wrap them with plastic wrap to keep them from drying out. Thank you for this info. I just saw a recipe I want to try but had no idea where to buy the rice paper or really how to use them. 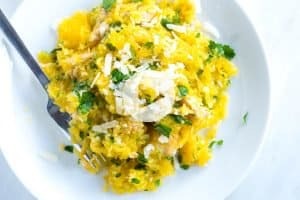 Now I do and cannot wait to try the recipe! Hi, I opened my rice paper rolls a while ago! I put them in a zip lock bag in my cupboard, and recently wanted to make some Again! They’re the exact brand as that. I was wondering if you know if they exprire or not as I can’t read the package! Thank you! If the wrappers were stored in a bag (we like using a resealable bag) then they should last a couple years. I made theses today and all went well until I put then in a container to store and the stuck together. Any sugesstions for keeping them from sticking together. I rubbed olive oil on my hands and sort of got them unstuck but just wondering if there’s some sort of trick? Hi Barbara, We’re not sure of any special tricks on this one. Placing a piece of parchment paper in between the rolls or individually wrapping with plastic wrap is probably your best bet. I wrap them and leave them whole then wrap lightly in saran wrap. I cut the rolls into smaller pieces just before I am ready to eat them. I even make them the night before and take to lunch the next day. love that little chew. Thanks. Good info. So easy. There were no instructions on the package! Thanks for a nice & simple how-to guide. It was just what I was looking for. Have not yet tried the BLT but I like the idea! Thank you! In the UK they are called spring rolls and once filled are deep fried. They have something similar here called Nems that have meat or prawns in them. They are wrapped in some kind of batter and are not very good. To work easier with rice paper, don’t leave it in the bowl of water for too long. I usually just dip it in the bowl to get both sides wet and remove immediately, lay on a plate (paper plate not recommended as it is sticky when hydrated). At this point, the sheet is still hard but don’t worry, wait 5-10 seconds, the rice paper will soften to an elastic consistency, making it easier to roll with minimal tears. You can fry the rice paper wrapped with meat inside but it’s tricky to get the crunch right. 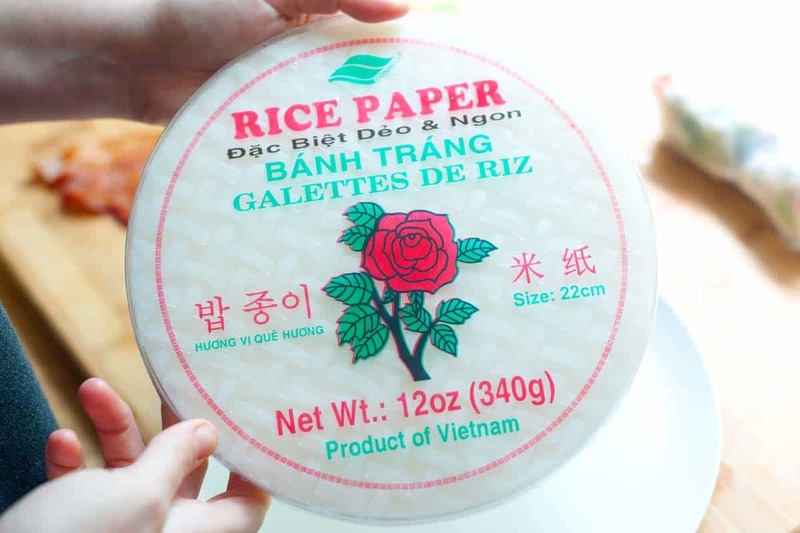 Some eggrolls are made with this type of rice paper. I’ve never used rice paper before. Are they strictly for cold dishes or can they be cooked as well? We personally stick to cold dishes. Sorry, but the Rose brand is not reliable. This seems to be the only brand avaialble in Canberra, Australia for I live. Tried on three separate occassions with the Rose brand only for it to keep breaking and breaking. Given up totally on making rice paper rolls now. And I tried different temperatures for the rice paper rolls each time. Nothing worked. Maybe I was using fake Rose brand or something. thank you for posting this. I saw a recipe i wanted to try but had no idea how to work with rice paper. very good info. thanks again! I want to brown the rice paper and use it for things like a strudel. How do I do that? Very helpful. I worked with rice papers the first time today and after assembling all my salad rolls, my boyfriend asked, “don’t you bake or fry them now?” I wasn’t planning that- but got me wondering… Is it possible to bake the spring rolls after you make them? I’ve been searching all over the Internet and stumbled upon your page. Any idea? We don’t recommend it. Some people have success with it, but they are really fragile and crack easily. Thanks a million for the post, really helped. If you or any of your girl friends are looking for a Liverpool located hair dresser, maybe for a girls night out or an office party then come in and see us at Blonde Moments Liverpool. Thanks for the info. Have never used rice wraps and the package does not tell about soaking them first. Thanks for your help and I will try on right now! How delightful, I love rice paper wraps. I totally want to make a BLT-roll now! 😀 The images are beautiful and instructive, thank you for putting so much time and love into your blog!